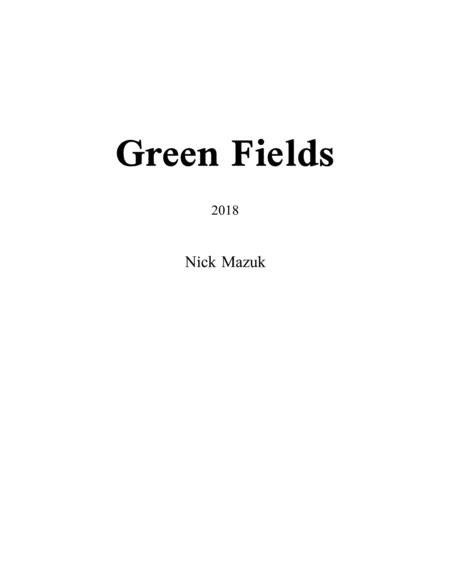 Composed by Nick Mazuk. Contemporary Classical, Neo-Classical. Score, Set of Parts. 86 pages. Published by Mazuk Music (S0.324225). Picking a title for many pieces is often quite difficult for me because typically when I write music, I do not have any particular object or nonmusical idea in mind. Instead, I simply write music. And this piece, like many other pieces of mine, didn’t get a title until weeks after completing it. 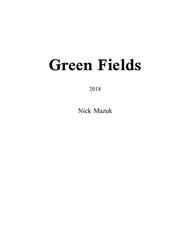 But as you listen to the piece, notice how well the title Green Fields works. Harmonically, this piece combines many elements often associated with the countryside. Several sections, including the oboe solo about two thirds of the way through the piece are modal, which is reminiscent of many English folk songs and the music of Ralph Vaughan Williams. Furthermore, quartal and quintal harmony appears throughout which is often associated with the American countryside and made popular by Aaron Copland.